Matt Johnson grew up on Lake Minnetonka where he enjoyed activities like boating, fishing, waterskiing and hockey with his friends and family. His extensive knowledge of the area proves him to be the ideal Realtor® for clients buying or selling properties on the lake. Matt draws from over 15 years of experience in sales, marketing and sales management. Ron Johnson (Matt's father) has lived on Lake Minnetonka for over 40 years. He draws from several decades of experience in the commercial hardware and construction industry. Ron's depth of knowledge on many subjects has proven invaluable to many a home buyer or home seller. Ron joined Minnetonka Matt Team in 2011. Susanne Johnson (Matt's wife and better half!) 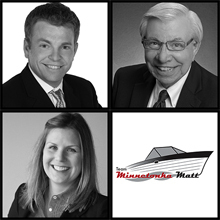 is the newest addition to the Minnetonka Matt Team, having joined in 2015. She has 17 years of experience working in the corporate world on a wide range of projects - including technology and organizational change management. Her real passion lies in design, and this is evident in the photography and home staging services she offers to Minnetonka Matt clients.